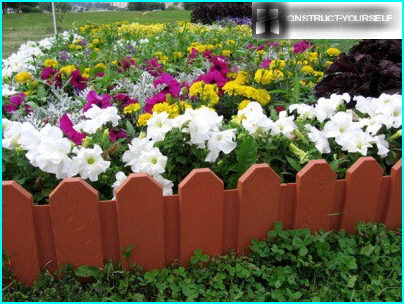 Motoblock is an indispensable assistant to the ownerbackyard, garden or garden. Compact equipment has replaced manual labor, thus improving the quality of ground handling and save time on each operation. With the arrival of winter behind tractor can be used for snow removal. The easiest way to make a snow-plow from motoblock their hands with a special snow-removal tips collected at the factory. However, craftsmen prefer not to spend extra money for ready attachment and collect from existing parts and building materials for a homemade snow-plow Motor-blocks, working on the same principle as that of factory products. How to turn a small walk-behind tractor bulldozer? Manufacturers attachments offerthree variants of snow removal attachments to tillers, different way of cleaning the snow mass. Just a well-fallen snow is swept away from the cleaning surface using rigid rotating brushes. 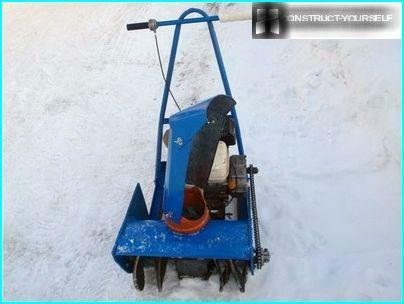 Such a snowthrower for motoblock indispensable where the track and playground are decorative coating, which can not cause harm during snow removal. The brush is attached under a canopy on the rotating shaft. 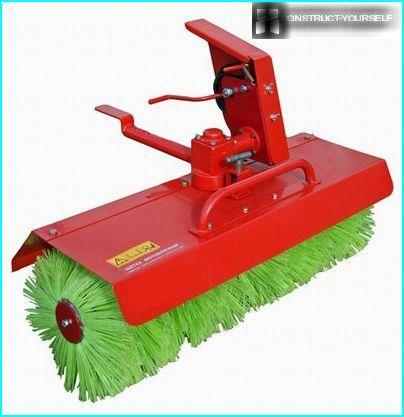 In one pass behind tractor equipped with abrush cleans the track width of one meter. You can adjust the capture angle in three directions: left, forward, right. Treated height adjustment and stripping, which simplifies the use of attachments. With wet packed snow and hard to handlerotating brushes will not work. It is necessary to use a harness with a snow shovel blades. Motoblock with a nozzle like a small bulldozer, which is able to loosen the layer of snow, grab a lot of snow and move it to the dump. The bottom side of a shovel manufacturers specifically obbivayut rubber band to protect not only the surface to be cleaned, but the tool itself from possible damage. Krepjat suspension snow shovel to the tractive unit via the front of the universal hitch. The width of the cleaned surface at a time is also one meter. Adjust the blade can be vertically and in three directions. speed motor cultivator fitted with a spade in the harvest period is from 2 to 7 km / h.
With large amounts of snow mass easiersnegosbrasyvatelyu rotary handle. 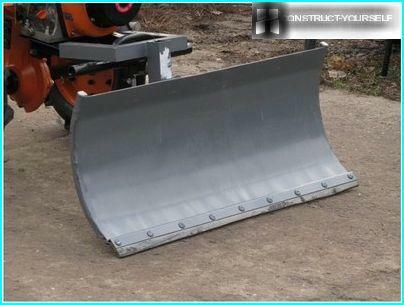 When using this attachment snowthrower for motoblock having the greatest performance of all the options considered, it is possible to carry out snow fence to a depth of 250 mm. The main elements of this nozzle design is a simple screw, which is combined with the impeller. Rotating auger captures snow pack, by means of which the impeller is moved upwards. Snow, passing through a special funnel, with the power emitted beyond clears the track or pad. Monitor the work of the rotary snow plow attachment, suspended on the tillers, it is very interesting. Important! In the design of universal motor blocks provided by the presence of systems that protect the rotor from falling rocks and ice. This option is required for winter machinery. We must keep this in mind and by controlling the motor-block, be careful. Otherwise it is necessary to do the repair snow removal attachments. Given that the walk-behind tractor still largelydesigned to work in the warmer months, when winter operation equipment should keep warm. This will not spend time warming up the engine, and immediately begin to snow clearing. It would be nice, and used to replace the grade of oil forgear. Under the influence of low temperature oil thickening exposed. Therefore it is recommended to switch to a liquid brand or immediately purchase synthetic oil specifically designed for extreme conditions. For snow removal can not involve itselfwalk-behind tractor, but only its engine. 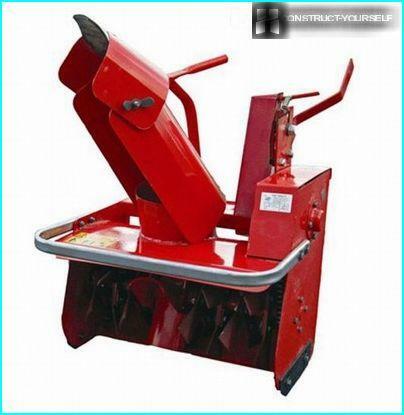 Roofing iron is used to make the body snowthrower auger. Plywood 10 mm thickness suitable for creating sidewalls. 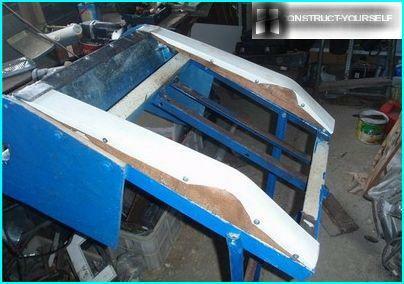 The frame is welded from metal corner. Poldyuymovuyu pipe fit under the handle and the tube from three quarters of an inch makes worm shaft. Through propyl made in the middle of the pipe, it is used for fastening the metal plate (blade) having dimensions of 120 by 270 mm. The blade is intended to tilt the shaft rotates the snow. Pushes weight to the snow blade in the makeshift construction snowthrower should be double-threaded screw, which is taken for making the sidewall of the tire or the conveyor belt thickness 10 mm. Suffice it to half a meter tape, jigsaw to cut out the four rings. The diameter of each of them must be equal to 28 cm. 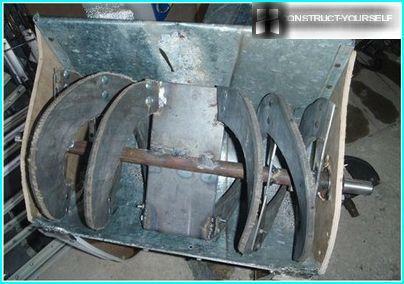 To fix the quick-engine platform,borrowed from motor cultivator to a tube perpendicular to the plate welded metal corners. For a free entry shaft in self-aligning sealed bearings 205 must be made at the ends of a pair of cuts and obstuchal them. 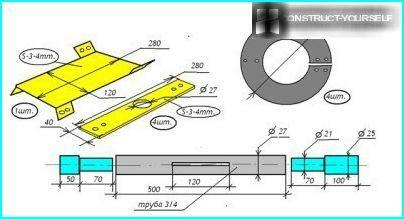 After this operation, the shaft diameter is reduced. For the key under the star on one side of the shaft is a groove. Important! Bearings must always be closed as snow should not be allowed to enter them. Construct a better bet than the wheels thatbecome stuck in the snow and on the ski. From the wooden bars are machined base skis, which are mounted on plastic overlays for better glide. The use as linings can boxes used in the installation of electrical wiring. Swivel spout necessary for tiltingsnow in the desired direction, are made of plastic sewer pipe of large diameter (at least 160 mm). Fasten it to a smaller diameter tube attached to the body of the screw. By pivoting chute is attached a piece of sewer pipe, which will guide the snow output. The diameter of the gutter should be greater than the width of the screw blade so as not to delay the advancement of the snow mass, leaning back with it. Important! Swivel spout allows you to adjust not only the direction of snow garbage, but also the range. Trench Length affects the distance over which the max "fly away" snow mass. 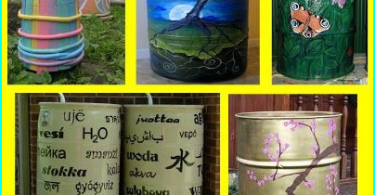 To give a makeshift designpresentable, it is necessary to paint all of its details in bright colors. Upon completion of homemade piloted and then maintained throughout the winter period. Some artists go a step further by making a self-propelled version of the snowthrower. Mechanize manual labor tend to all the people,inhabitants of the earth. After reading how to make a snow-plow from the engine and other parts walking tractor, some will not "reinvent the wheel", and decide to buy the factory model snowthrower. To purchase option would require a budget of about 20-30 thousand. Rubles. The acquisition of prefabricated attachments for Tillers cheaper and a half to two times. To build a makeshift construction will have to spend only for the purchase of certain spare parts, as well as to allocate for work a couple of days. In any case, the problem of snow removal from the local area will be solved.